Capital-Coins.com Review – Deceptive & Corrupt Crypto Brokerage Exposed! As you can infer early on from the title of our unbiased review, Capital Coins appears to be a phony scam brokerage targeting the cryptocurrency community. Brought to our attention by the considerable surge of interest taking root within the crypto community, we felt obligated to investigate this new investment brokerage and address our findings to the crypto community. As you will soon begin to realize, the more you read about our disclosed discoveries regarding Capital-Coins.com, the more illusive and dangerous their investment platform will appear. Capital-Coins.com is an online trading platform that supports cryptocurrencies along with a bundle of CFDs and FX options. Prioritizing their platform around cryptocurrencies, Capital-Coins claims to have been the leading cryptocurrency destination for 3 years in a row. Allegedly supporting over 300,000 active traders per month, Capital Coins excessively boasts about the opportunities available through their platform and why they are the best possible investment platform. While all of these claims may sound amazing, not one of them is true besides that they allegedly supporting cryptocurrency assets. For instance, Capital-Coins also claims to be regulated through a multitude of regulatory agencies, yet when you run their disclosed regulation numbers they actually appear to be the active regulation numbers for eToro, a social trading platform, not for Capital-Coins.com. In addition, they claim to have been a leading brokerage for 3 years, yet a WHOIS report will reveal their site was just created on August 29th, 2017. According to the About Us page featured at Capital-Coins.com, Mickael Jhonson is the alleged CEO of Capital Coins. As expected, we could find no presence of Mickael Jhonson being an existing entity anywhere on the web, which leads us to believe that he doesn’t actually exist. 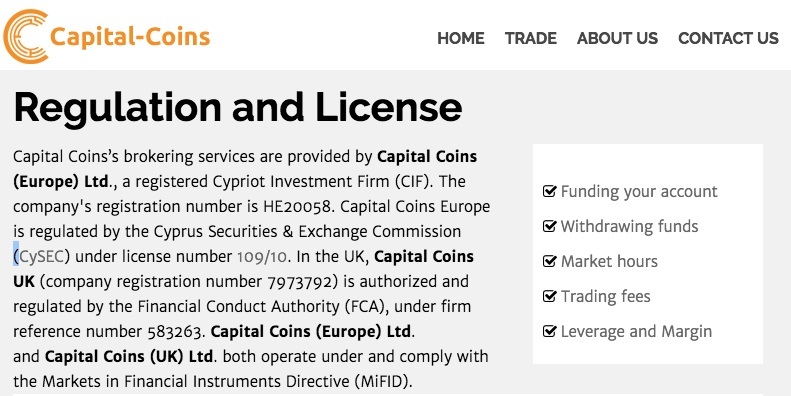 Furthermore, according to their Regulation and Licensing page, Capital Coins’s brokering services are supposedly provided by Capital Coins Ltd, a registered Cypriot Investment Firm (CIF) listed under the company’s registration number of HE20058. 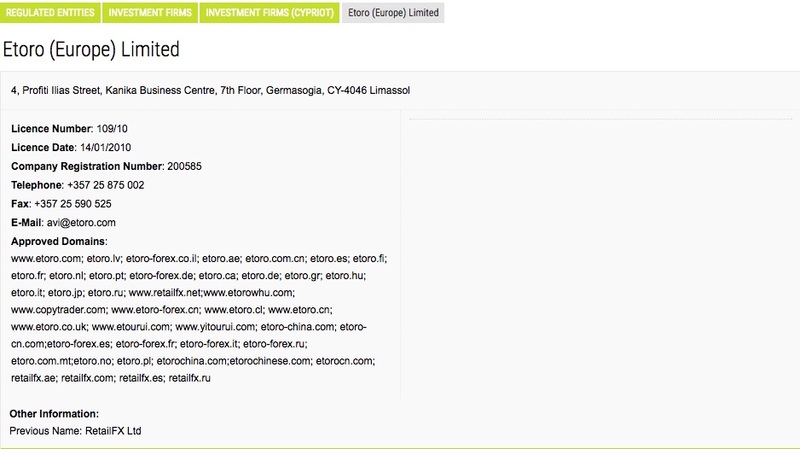 Interestingly enough, when conducting a search across the CIF site to confirm Capital Coins Limited as an existing entity, the site failed to generate any credible search results, while the allegedly company’s registration number provided was actually the registration number of eToro Limited, the corporation currently supervising the immense social trading platform known as eToro. According to the eToro CySec profile, Capital-Coins.com is not one of their approved domains, which leads us to believe that this scam brokerage probably just tried to play it off as their own as a method to build credibility. Other falsified attempts employed through Capital-Coins would be copying eToro’s UK Financial Conduct Authority (FCA) reference number of 583263 along with asserting that Capital Coins Ltd are corporate entities headquartered out of the UK and Europe when in reality they do not exist. Capital Coins offers investors the ability to invest supported cryptocurrencies in a contracts-for-difference trading style. Supporting Bitcoin, Ethereum, Ripple, Litecoin and Dash, investors are encouraged to leverage the financial markets by utilizing margins produced through their trading platform. Employing financial advisers, who don’t appear to be licensed, to help aid you in your investment endeavors appears to be highly encouraged throughout their site along with their copy trading investment style. Where do we begin? Well, it is obvious to us that this entire operation is a red flag, nothing featured on their site appears to be authentic. Claiming to be a fully regulated brokerage while trying to mislead investors into believing that their disclosed regulation numbers are their own is a blatant scam tactic. In addition, their alleged corporation doesn’t actually exist while their platform comes nowhere close to supporting 300,000 traders per month, let alone obtain 10,000 visitors per month. If you value of your hard-earned money you should avoid Capital Coins, it is as simple as that. It is evident that the conspiring scammers behind this operation aren’t looking out for your well-being by lying countless times about their platform. Why put your faith and money with an online brokerage that is intentionally manipulating you with the sole intention of earning your trust? Capital Coins isn’t the only brokerage trying to manipulate online investors into believing that they are a regulated trading platform. 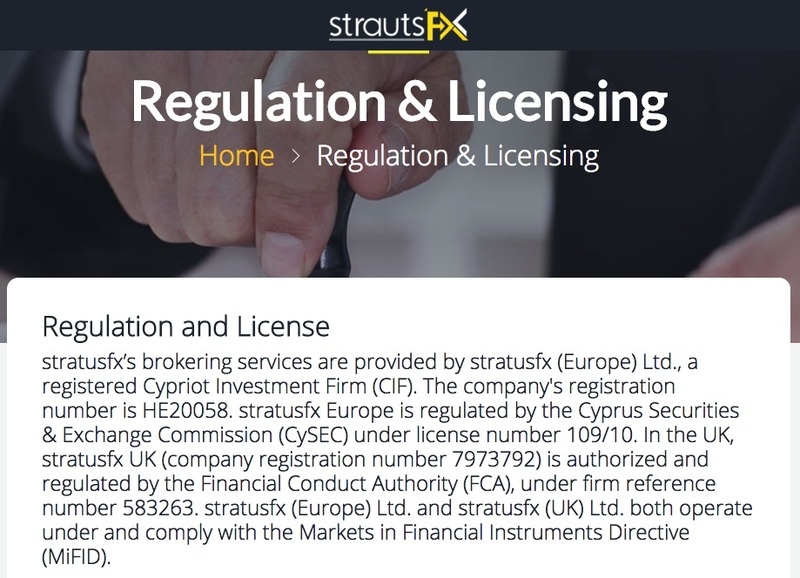 StrautsFX.com is another pathetic brokerage that attempts to portray eToro’s extensive licensing and regulation as their own. Although we found no correlation between Capital-Coins.com and StrautsFX.com, we felt that it was necessary insight to incorporate into our comprehensive review that hopefully saves investors from financial losses in the future. Capital-Coins.com functions as an untrustworthy and feeble scam operation meant to target inexperienced cryptocurrency investors. Portraying their trading platform as a fully regulated CFD platform that supports cryptocurrencies, the number of falsified claims that we exposed throughout this scam review is not only excessive but ridiculous. When researching into possible investment solutions, make sure you conduct fundamental research prior to committing, this simple step could save you from a lot of heart-ache and financial losses down the road. Review Verdict: Capital-Coins.com is a SCAM! Do you have any experience or insight to share regarding Capital-Coins? Please disclose your knowledge or feedback by leaving a comment below! To learn about legitimate cryptocurrency based platforms, feel free to visit our Crypto Day Trading Guide. By signing up with the below services, we may receive a commission, which allows us to keep providing you with free content. Thanks for your support! Arnaquer de 10 000€ par capital-coins.com, qui m’affirme à plusieurs reprises qu’il me vire l’argent réclamé, mais rien plus aucun contact avec mon interlocuteur qui m’avait promis des bénéfices conséquent. les sites proposant une action contre capital-coins.com sont aussi corrompus qu’eux et vous demande de l’argent pour commencer une action qui selon leurs dires peut durer de quelques mois à plusieurs années, ce qui n’empêche pas le pDG de cette société de rouler en Ferrari, au frais des gens arnaqués par capital-coins.com et par eux-même. Pour l’instant je suis dans l’impasse. Hello Marchal, did you receive anything? Notting.. and more. I am NOW sure That this compagny steels money as soon as they receive payments from the investors. I am not the only one That face this situation. People lose lot more Than i do. it sounds like you are a leads marketing affiliate. why do you trash some sites and glorify others that all do the same type of trading. do you sell leads to trading platforms? Why are you deleting comments? I tried to open an account before seeing your review but none of it is there? And what regulation should people look for? Crypto has no regulation whatsoever. Just checked their website, nothing of what you claim to show is there… Plus, isn’t cryptocurrencie trading does not require any regulation since THERE IS NONE!? Jet Mining Review – A Deceptive SCAM! Coins 247 Review – A Reliable Crypto Broker? GPU Mining Review – Reliable Mining Solution? BTC Miner Ultimate Review - Btcadder.co Scam? FreeBitco.in Review - Legit Bitcoin Faucet or Scam? Bitcoin Loophole is a SCAM; Indisputable Review!